The ithlete ECG receiver is a small piece of hardware that picks up the signal from your heart rate monitor chest strap. It plugs into the headset jack of your Apple, Android or Tablet device. 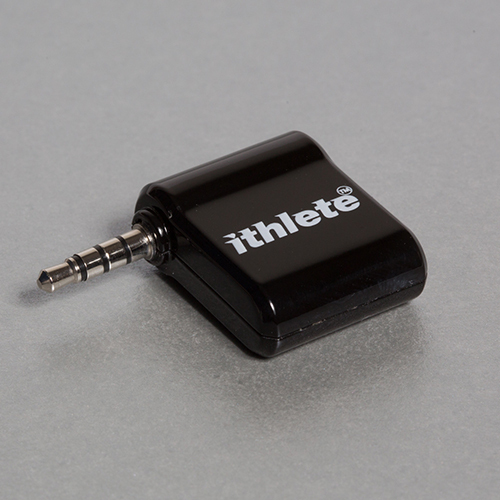 The ithlete ECG receiver picks up the wireless signal sent from your HRM chest strap. This allows the time gaps between your individual heart beats to be measured very precisely by the ithlete app. 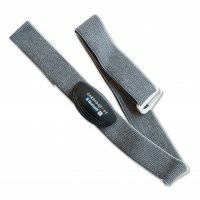 This is the best choice for someone who wants to use ithlete with their existing compatible HRM chest strap. You do not need the ECG receiver to be attached when you review your results and progress in the Chart view or Edit view. It’s really useful for chronic overtrainersmlike me. Seems to work fine and picks up the HR transmitter right away. Great product. Most useful to me in persuading me to not train when it is low. Super easy to use, makes it easy to monitor progress and decline on a regular basis. Does exactly as promised, easy to use. Has become a part of my daily routine. Does what it says on the box! I have been suffering from PVS (Post Viral Syndrome) was was finding recovery very hard after training. Ithlete has helped me get back on track. Know when to train and how hard as well as see how my current training is affecting my fitness. The ithlete has been a great motivator for me. One of the interesting things for me (this proves we are all unique) is my HRV is higher the day after a signigicant workout. Once I figured out that I needed to remove the cover from my iphone everything worked fine. Great productive, easy to use and understand. My athletes are great examples of using the tool. We are able to make smart choices in training when we need to. Un producto fantastico, ahora puedo saber perfectamente como es mi estado de salud y si debo o no entrenar intenso o suave. Lo utilizo a diario. This product has revolutionised my training. The receiver works very well with my IPod Touch. It picks up the Polar heart monitor without a hitch. I like the device. It does what I want it to do. I like the product. It does reflect how I feel and if I work out hard the next day my numbers go down. I am a scientist so I have analyzed the daily variance to see how useful it would actually be (i.e. if you take a reading every five minutes for an hour, how much variance occurs) and was pleasantly surprised to find the standard deviation to be about +/- 2. My one complaint is that the units are never shared (I am still not sure what the actual number measures) and as a biologist I would find this interesting. I love this product, it gives a much better indication of my ability to exercise than resting heart rate. Great product. Allows me to effectively monitor my recovery and training intensity. Can’t imagine training without it anymore. Great product for anyone wanting to maximise their training. Love it. Noticeable improvements since been using. Works as it is supposed to. Easy to use. Excellent, helpful product. I have adrenal fatigue and the Ithlete ECG Receiver assists me with my weight training and other physical activities. I highly value the information that I receive and am using it to regain my health. Thank you for a wonderful product. Have been using it for a month and seems to be an excellent peice of kit so far. Realy need to look into it further but it is somthing I may possibly use in my further studies. It’s good and it is affordable, including the app. Information re which chest straps it works with was handy. I use it every morning. It’s simple to use and I can monitor and adjust my training accordingly. An excellent training tool which pick up early signs of issues such as over training or illness. This is a great product with a lot great benefits, not only for body fitness and to look closly fo one’s health. The ithlete works extremely well and is very easy to use, supported by a well thought out app. Reviewing HRV as a training aid is beyond the scope of this review, so please read up elsewhere,however, the app and hardware do make using HRV nice and simple. Just plug in the dongle, put on your heart strap, launch the app and follow the instructions. The use of simple colours to indicate where you are that day makes it a breeze to understand. I had used FirstBeat software in the past but its really more comprehensive than is really helpful, whereas the ithlete just tells you what you need to know to determine todays training effort. Well worth buying and using. As a competing triathlete and triathlon coach I have incorporated this product into my daily program. I find it instrumental to help manage training load which many triathletes struggle with. this reciever connects faster then the older one. Very nice and helpful piece! Receiver range could be bit wider. Software is very good. An alert for cardiac arrhythmia would be nice. I am a runner who routinely runs 5 miles three times a week. In 2011 I increased my mileage and began running 5, 6 and 10 miles a week. But along the way my running times deteriorated and I began to feel tired even during off days. My resting HR was going up. In retrospect I had slipped into overtraining. By the time I figured this out, I was in late stage 2 overtraining. It took me 3 months to get over it. In my investigation of overtraining, I came across studies showing a correlation of training level with the variation of heart rate between inspiration and expiration. As values lowered, the more likely someone was overtraining. One of the articles I read gave a favorable review of the ithlete which measures HRV with respiration. I decided to order it and began using it in September of 2011. It has been invaluable in my training. The readouts give a numerical value and let you see how much you have gone up or down since the last measurement, but more importantly the color coded result lets you know how much you should train that day, if at all. Since purchasing it, I have used it faithfully and not only have I avoided overtraining, but I have identified those days when I can go full out and my running has improved. I recommend the ithlete without any reservation. No point training hard when your tired. This product really helps with that. Great piece of kit to link heart rates with Runkeeper activities! Great receiver. Works as advertized. The product works exactly as advertised. It is very easy to use, and it has had an impact on my training for the better. My only regret is not to have purchased one sooner! I have been waiting for a product like this for years. I am 67 love cycling, running, walking and mountain walking. I am quite capable of pushing my body beyond what is healthy and needed some barometer of my state of recovery. This is that device. I am still establishing a good baseline but am much better informed about my state of recovery than I have ever been. It is so convenient to use and only takes a minute. So far it is working well. I have had no problems. I am getting good feedback, when I can remember to hook it up in the morning. 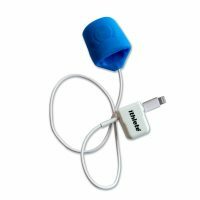 The ithlete is a great product. It is extremely useful in monitoring recovery of my training by providing an objective data result. I use it everyday as a strength and conditioning coach. It is easy to use and affordable. Every athlete or coach that is serious about results and training should consider adding one to their arsenal of tools. Very easy to use, great accurate results and it makes knowing whether to train or not really simple. It works good with my new ipad-air. It does not with my older iphone 4. I got help from you to fix that problem, but right now it still does not work. Great improvements over previous generation. I guess the ultimate test for this product will be how it improves my ability to train with more accuracy but as far as the dongle itself goes the delivery was quick and it seems to pick up on my Polar HR band within a few seconds of starting the app and keeps the connection. It’s small but seems pretty sturdy and likely to survive pockets modern life. The simplistic yet effective approach to measuring HRV is remarkable. This product makes sense to anyone who trains seriously and wants a better understanding of what true recovery means. Great quality and works every time. Detects the heart rate strap fast with no fuss. An excellent tool, works well with Beurer heart rate strap, a little known brand in Australia buta good HRM. HRV is a great tool for the middle aged athlete. It works well with a Samsung Galaxy tablet [and Polar chest band] although the app description on the Google site states that it is for a phone. I’m satisfied with the ithlete ECG receiver and the app. I use it with a couple of polar HRM receivers. Prior to buying the product, I was coming off a slight over-training, doing 6-8 hours a week and continuing with each and every workout even in really hot days. I’ve been training using the Maffetone Method using MAF and Phils recommended diet of no grain/no highly processed food. My only problem in the mafettone method is I wouldn’t know if I overdid my weekly training time until the next MAF test session. That is running the same route with a distance of about 8 kms/5miles every 3-4 weeks. With only the MAffetone method, I wouldn’t know until the next MAF test session (3/4 weeks). This tool fills in the gap of measuring your body’s response on a daily basis. It removes the day to day guess work of determining if I have to rest, take it easy or go on with a regular work out. I’ve been using it for about a month now and I have improved my times in my recent MAF and other tests. The ithlete receiver is a a very simple device that enabled me to start using ithlete with my existing heart rate monitor. The receiver easily finds my Polar H1 heart rate monitor. If the receiver doesn’t seem to find your heart rate monitor, make sure Blue Tooth is turned on. I’ve only been using it for a few weeks. It seems to correlate well with difficult sessions and recovery. It’s definitely a better indicator then pure resting HR. As my training ramps up it will be interesting to see if it continues to be accurate. I have used the original ithlete for around two years and had to replace one of the early models but this seems to be more robust case and stronger signal. Good aid to determining training intensity. So far, i am delighted with the product. I have begun setting my alarm clock a couple of mins early so i can build it into my daily routine. The app is great for recognising those days when you should back off a little, but it is also great for identifying those days when you might have planned an easy session, but a high HRV reading means you can upgrade to a hard session and enjoy the extra fitness benefits later. On race days I open the app with a little trepidation, hoping for a high reading. yesterday I had a big race and a very easy week leading up to it so I was hoping for a high HRV score despite having a slight upset tummy. THE HRV score read 73 and indicated that I was not ready for racing, but of course I raced anyway. I felt awful but got through the course with a PB despite severe stomach cramps which i never had before. I guess this means that the HRV app was accurate. At a previous race the app gave me a score of 88 and I had a fantastic race and felt very strong throughout. I’m not sure to what extent, the relationship to race performance is psychological, ie if I get a high HRV it does boost my confidence a little and allows me to push that little bit extra, it’s probably 90% physical, 10% psychological. overall it’s a great little tool, very simple and quick to use and if used consistently it’s like having a personal trainer, pushing you on when you have the capacity and holding you back just when you are about to go that extra mile too far. The first rule of HRV club is don’t miss an HRV reading every day, or you’ll mess up your info. I have been happy with this product so far. I am not an avid fitness person, but I am enjoying seeing that I have made progress since charting my HRV for over a month now. I will continue to use this product. I wish the product took a longer reading, but only because 55 seconds doesn’t seem like a very long time to be have centered yourself (which isn’t really a problem since I do it shortly after waking up anyway). But still, it seems like 2 minutes wouldn’t be too long, and maybe the reading would (or would at least feel like it) be more accurate. I have not actually been using this product as carefully as I could or should be, but I feel like I understand what’s its telling me. So I’ll start there and build slowly. I love the science behind the product and I love the product. I do not regret my purchase. The only neg. is consistency. Sometimes it connects and reads quickly off my chest strap and sometimes is doesn’t. I have used 2 diff chest straps and inconsistency continues. It was PERFECT this morning though – fast connect. A more extensive charting/metric software ability would be good and I thin it exists – Joel Jamieson has a similar or same product he’s offering. works as stated, the reason for the 4 stars is that it would be nice if it was compatible with more heart rate straps, especially the ANT+ ones. Bought this to replace a receiver I lost. The pickup range however does not seem great (same as the previous one) and I find I have to hold the phone very close to the strap when doing the measurements in the morning. Does the job, it seems. The app often doesn’t recognize this or the HR device until completely quitting the app. Not sure whose fault that is. I find the ithlete receiver and app a useful part of my training programme. At first, I was have trouble getting the receiver to work with my existing chest strap, however after ensuring the chest strap electrodes were completely moistened, it works perfectly. What I have noticed, is that on some rest days, my HRV score is lower than I would expect and conversely, it can occasionally be higher the day after very hard sessions. Perhaps there is a delayed recovery response happening here, but generally it follows my training intensity and over time and is showing an upward trend as my fitness improves. I would not be without this app, as it is a great tool to monitor your progress and prevent overtraining. Does what it needs to do. However occasionally signal cuts out. Build quality could be a little better. With daily use in not sure if it will stand the test of time. Feels cheap given the price. I like the APP and the product but if I had known ahead of time I could just use a bluetooth strap without having to purchase the receiver, I wouldn’t have bought the receiver. I have been very happy with the ithlete hardware and app. It would be nice if the app had a little more detailed documentation about what it’s measuring and how it works, but overall I have found it to be a helpful training aid, and as I said I’m very pleased with the whole package. I have not found the PP HRM app to be useful, however, primarily because the ithlete hardware doesn’t seem to be able to send a signal far enough to get it to my iPhone while exercising. I understand that the app says it doesn’t work as well, for example, at the gym because of interference from the machines. I knew that going in so I’m not disappointed, but that’s at least half my workouts, so I have to log those a different way, which makes the PP HRM app not very useful. This is a very good app that is simple to use and makes HRV measurement accesible to anyone who is interested in it. While HRV can be measured by various HR monitor watches not all of these translate the data into something that can be used to direct training. Ithlete does this very nicely. I am using the latest version of the Ithlete software on Android and the second generation receiver. It does not work on the HTC sensation but works fine on the HTC Desire. Ithlete does exactly what it says it will in the product description. I am not basing my training schedule exclusively on Ithlete and do try to schedule sessions to maximise recovery. But I do take notice of its warnings and reschedule hard sessions if my HRV is low. I have found that the when a low HRV is measured by Ithlete it corresponds very well with reduced sleep, illness and heavy training sessions. I have also found that as fitness improves and when I am well rested HRV increases. Because of these observations I do listen to it more to tell me when to rest or when to go all out. The latest software has some nice additions particularly that it waits until HR stabilises before starting a measurement. This has greatly reduced the variability observed and improved the reliability of the data. The possibility to record duration and quality sleep and training loads and graph them against HRV is also nice as it allows you to look back and correlate these variables with changes in HRV. Ithlete is simple to use, as per the instructions. Don’t over think it just try to be as consistient with when you record your data so you are comparing like with like on a daily basis. Service from Ithlete has been excellent with quick shipping and responses to quries. Accompanying information is sufficiently explanatory. Signal strength to heart monitor is weak. Transmitter power could be greater. After strenuous exercise results indicate appropriate light or rest period. Seems to work well after ~4weeks of use. Does what it should, no more, no less. Starting to dabble with HRV and I am impressed with the app. Easy to use and quick, provides valuable information. Works great on my iPhone. Works great! I’m still using it with my old HR strap. Does what it says, although if I take a succession of readings, they can vary quite a bit. The android app definitely needs some work. For example, it would be nice to be able to delete an entry from the details screen. Also, it would be nice to see more details besides just the number from 1 to 100. Is my sympathetic nervous system balanced with my parasympathetic nervous system? Is there anything else you can infer from the HRV data? It is easy to be unhappy with the numbers at first, especially if the initial experience is at altitude with skiing and indoor cycling training, but after a few weeks it is clear that the system is a good numerical representation of both fitness and fatigue. Isn’t that what every athlete wants? Generally works well, but works better on iPad than iPhone5. Takes a long time to register “ready to start” on iPhone5. New receiver is no better than previous one in that regard. Had one already before which did not work 100% correctly. The distance works better on this one compared to the old one. Excellent piece of kit to link a heart monitor chest strap to your i-phone and a fitness app. Would get 5 stars if the reception didn’t drop out occasionally! It does what it’s supposed to do, and does it quite well. The missing star for not doing anything else. I mean, I have both iThlete app for HRV measuring, and PP HRM which is supposed to be used during training but as a training app it leaves a lot to desire. I understand that this is an issue with the apps, not the receiver, but all in all I think with little work one could make this little gadget give more ‘bang for your buck’. It works very well and helps to decide to train or not too. It is working perfectly as advertised. Had a Suunto pulse belt. After 3 months I am very happy with the results of Ithlete. I have not had the usual cold I routinely get as I am not overtraining. It has also encouraged me to complete the planned harder session when I have been feeling flat yet my HRV is positive. This could be something I use till the end! The item is fine. I would have liked further documentation on purpose of use. Sure I just need to do more research. Would be nice if it came with it. Simple to use but being black means it can be lost in ‘dark’ corners! It’s very good. Sometimes the readings are a bit off however. I have used it for 1 year now. I am happy with it though. I’m afraid to break it so I leave it at home when on (short) training camps. The theory behind the product is interesting, and potentially very helpful. As a serious athlete, if I can better anticipate how my body will react to different training and racing efforts, I should be able to train more effectively. However, during the four months that I have been using the product on a daily basis, I have found little to no correlation between training loads and the HRV. In fact, when I was sick for a couple of days after a very hard bike workout, the HRV was quite high. In other words, the HRV suggested that I was rested and ready for hard training, but my body clearly was not. Easy to operate, but reception is spotty. If i’m honest i’m not convinced it works for me. At time it doesnt pick up when i am fatigued. Product works as indicated. I’ve had difficulty getting reliable readings day-to-day and finding the right time of day to take the measurements. I am not using it very much at present. I can not review the detailed information about the beats by minute during prolonged exercise that should be included in the continuos graph. Can be exported the time and heart rate data in text file? I’m happy with it thus far but it seems to be a little inconsistent in the readings, it often takes 2-3 attempts to get a reading, other times I get no reading at all. It is not the HR monitor or batteries as they are new. Over all I am pleased. I thought the range was going to be increased but mine didn’t seem different from the one I already had. it’s pretty finicky. I have to basically hold it on the heart rate strap. I am using a polar t30 with it and the iphone 4.
if it would work all the time I would give it 5 because the it is incredibly useful for my training. I bought it for running, in.combination with my polar 5khz cheststrapp and android phone. But unfortunately this is not possible because that hardware combination doesn’t work with any normal running app. So I started using it for HRV measurements which works fine for my hardware. For running I will need to have a bluetooth cheststrap, and an android version that can handle bluetooth4. I ordered this product and did not receive for almost a month later. When I did email the help on the website they were very helpful and responsive. The dongle did not work. I trouble shot for about a week before I contacted ithlete and spoke with Simon. Simon was extremely helpful and gave me some more things to try. After trying all of these the dongle was still defective and did not work. Simon said right away he would send a new one. The customer service was phenomenal, but the actual product was defective. Would also be nice to have the graph show training load. Been using for 6 – months or so and it works well. I use it to decide my training for the day. I have been using the ithlete receiver every day for 5 years. I find it very useful especially if I am close to over training. It is very accurate in measuring my biorythems. A great piece of kit.